A 52-year-old man presented with a patchy black pigmented lesion in the plantar aspect of the left foot, which was diagnosed as a malignant melanoma. The patient underwent wide local excision of the melanomatous lesion along with sentinel lymph node removal. The lymph node was negative for metastasis. Four weeks later the patient was referred for 18FFDG PET/CT. 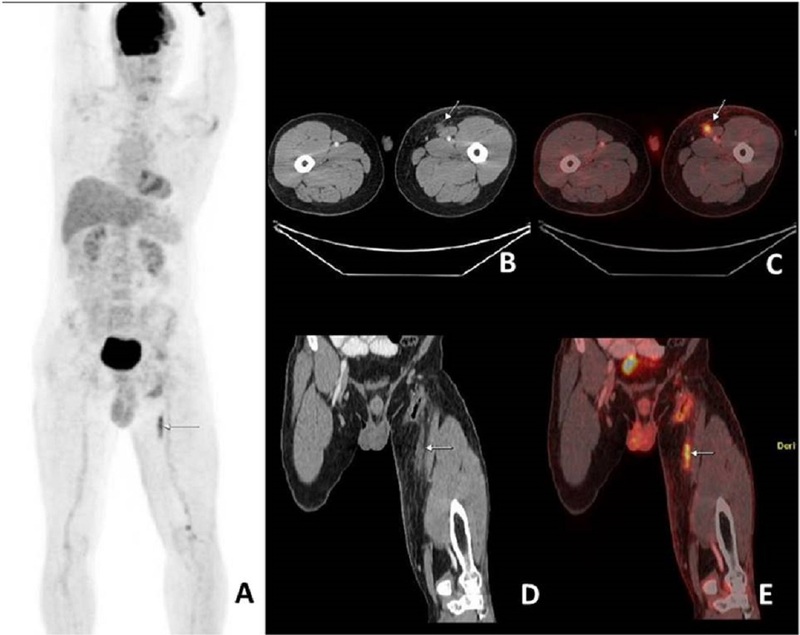 18FFDG PET/CT showed an FDG-avid linear, heterogeneously enhancing soft-tissue lesion of approximately 4.8 cm in length in the medial aspect of left thigh, anterior to the left sartorius muscle, suggesting in-transit metastasis (Figure 1). It also revealed postoperative changes in left foot. No other lesions were identified to suggest distant metastasis. Final histopathology of this lesion could not be obtained as the patient was lost to follow-up. The incidence of malignant melanoma, once a rare cancer, has risen, with an average incidence ranging from 2% to 20% in most developed countries.1 Lymph nodal and in-transit metastases in malignant melanoma have significant prognostic value, but detection of in-transit metastases is challenging. Malignant melanoma often metastasizes through lymphatic channels to the skin or subcutaneous tissues, as well as to regional lymph nodes. Skin and subcutaneous lesions that occur within 2 cm of the primary tumor are known as satellite lesions, while those that occur beyond 2 cm are considered in-transit metastases.2 Sentinel lymph node biopsy (SLNB) is the standard management approach for regional node metastasis.3,4 However, SLNB cannot detect in-transit metastases, which account for most locoregional recurrences.5 High-frequency ultrasound is considered the best modality for detecting and diagnosing in-transit metastases due to its high accuracy in detecting smaller lesions.6,7 However, this technique has several limitations, including its dependence on operator skill, availability of an expert radiologist, and long study-performance time (at least 30-40 min for each limb or body area). Sentinel lymph node biopsy was negative for metastases in our patient. Hence, he was referred for 18FFDG PET/CT scan as a part of metastatic workup, which showed in-transit metastasis in addition to postoperative changes in left foot. Although 18FFDG PET/CT is relatively less sensitive (especially in detecting smaller lesions) compared to high-frequency ultrasound, it has better specificity and is less dependent on operator skill. In addition, the modality can serve as a “one-stop shop” investigation due to its ability to detect distant metastases. Esther Erdei, Salina M Torres.A new understanding in the epidemiology of melanoma. Expert Rev Anticancer Ther. 2010; 10: 1811–1823. Morton DL, Thompson JF, Cochran AJ, et al. Sentinel-node biopsy or nodal observation in melanoma. N Engl J Med. 2006; 355:1307. Kretschmer L, Hilgers R, Möhrle M, et al. Patients with lymphatic metastasis of cutaneous malignant melanoma benefit from sentinel lymphnodectomy and early excision of their nodal disease. Eur J Cancer. 2004; 40:212. Grotz TE, Mansfield AS et al. In-transit melanoma: an individualized approach. Oncology (Williston Park). 2011; 25:1340-1348. Solivetti FM, Di Luca Sidozzi A et al. Sonographic evaluation of clinically occult in-transit and satellite metastases from cutaneous malignant melanoma. Radiol Med. 2006,111: 702–708. Visakh A, Pratap T, Babu AM, Jalal MJA, Raja S. In-transit metastasis of malignant melanoma. Appl Radiol. 2018;47(11):40-41. Prepared by Dr. Visakh while Senior Registrar, Department of Nuclear Medicine and PET/CT; Dr. Pratap while a Consultant to the Radiology Department; Mr. Babu while a Nuclear Medicine Technologist; Dr. Jalal while a Senior Registrar in the Department of Family Medicine; and Dr. Raja while Chairman of the Department of Nuclear Medicine and PET/CT, VPS Lakeshore Hospital, Kochi, Kerala, India.